Regarded as one of the most talented players of his generation, Matt Giteau became a stalwart for the Wallabies after making his debut as a 20-year-old against England at Twickenham in 2002 - before he had even made his Super Rugby bow. Kid Dynamite, as he is sometimes known, made his first start at fly-half against Namibia in the 2003 Rugby World Cup and notably grabbed a hat-trick of tries to announce his arrival on the international stage - later he appeared as a replacement in the Wallabies' narrow final defeat to England. 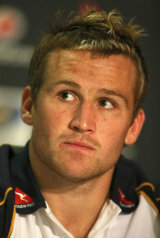 A nominee for the International Rugby Board Player of the Year in 2004, Giteau played the majority of his Test appearances at inside-centre but the versatile back has also been deployed at fly-half and scrum-half during his career. He missed the opening three Tests of 2006 with a knee injury, but announced his return with a two-try haul and man of the match performance in the record win over the Springboks in Brisbane. A few months later he made an experimental switch to scrum-half during the Wallabies' tour of Europe - a trial that continued briefly the following year. He returned to the more familiar position of 12 for the 2007 Rugby World Cup during which he collected his 50th international cap before bowing out at the quarter-final stage. With the arrival of Robbie Deans as Wallabies coach, and the retirement of Stephen Larkham, Giteau assumed the stand-off role. A graduate of St Edmund's College, Canberra, along with Wallabies legend George Gregan, Giteau took his next career step in his home town. Already an Australian Sevens and Under-21s international, he joined ACT Brumbies in 2002 initially on a one-year deal making his debut in 2003 where he played in the centres. He later put pen to paper on a three-year deal to extend his stay in the nation's capital having shared in the side's Super 12 triumph in 2004 that culminated with a 47-38 victory over the Crusaders. Having cemented his place in the international ranks, Giteau announced that he would be switching to rival Super Rugby side the Western Force in Perth for the 2007 season in a big money deal that saw him inaccurately dubbed the "Six Million Dollar Man" by the media. A reported A$4.5 million deal (partly funded by the Australia Rugby Union) plus third-party sponsorship deals saw him rocket into the ranks of the highest players in either rugby code - even rivalling the deals offered by the big-spending European clubs. Giteau made his debut for the Force at inside centre but played most of the season at fly-half as they reversed their torrid debut season, where they finished bottom of the table, to finish a credible seventh which they followed with an eighth-place finish the following year. In March 2008, amid links to a lucrative move to the northern hemisphere, Giteau signed a two-year contract extension with the Australian Rugby Union until the 2011 World Cup in New Zealand. As part of the deal, he agreed to stay with Western Force for 2009 but subsequently agreed a deal to move back to the Brumbies at the end of the season. Later in 2009 Giteau scooped the John Eales medal as the Wallabies' outstanding player despite calls in the media for Berrick Barnes to be given the No.10 jersey. Giteau endured a mixed northern hemisphere tour following the award, missing a conversion that would have prevented their embarrassing defeat to Scotland before tearing Wales apart in Cardiff. In 2010 Giteau was shunted into the centre after Quade Cooper's stunning Super 14 season for the Reds. He retained the kicking duties but was again criticised for some high profile errors, particularly in a narrow defeat to the All Blacks in Sydney. He lost his place in the starting side to Berrick Barnes on their spring tour to the northern hemisphere and subsequently announced that he would join Top 14 side Toulon following the Rugby World Cup. After a mixed 2011 Super Rugby season where his club side the Brumbies failed to impress, Giteau retained his place in the Wallabies side for their clash with Samoa. However, following their shock loss to the Islanders, Robbie Deans opted to drop the 91-Test veteran and instead charged Pat McCabe with the inside centre berth in their Tri-Nations opener against South Africa. Giteau failed to break back into the Wallabies side and missed out on World Cup selection with rival Berrick Barnes returning from injury to take his place in the squad. Giteau broke the news with his Tweet the day before the final 30 was announced where he said: "Really wanna thank everyone for the support! Was a huge honour to get the chance to represent my country as often as I did. #veryprivileged."